Why would I need self storage in Ponte Vedra Beach, FL? There are a variety of reasons why you might need self-storage in Ponte Vedra Beach, FL. How much is a storage unit in Ponte Vedra Beach, FL? The cheapest storage unit in Ponte Vedra Beach, FL is $56.00 per month. What size storage units do you have available in Ponte Vedra Beach, FL? In Ponte Vedra Beach, FL we have sizes that range from 5'x5' to 10'x25' to suit your storage needs. How much is it for a 5'x5' storage unit in Ponte Vedra Beach, FL? The cheapest 5'x5' storage unit in Ponte Vedra Beach, FL is $63.00 per month. The small, unincorporated community of Ponte Vedra Beach is a seaside town counted as part of Florida's Jacksonville Beaches area. Despite its small size, Ponte Vedra Beach is well-known as a Florida destination city, home to several high-end resorts and professional-level golf courses. Many of its residential neighborhoods enjoy beach access, making water sports among the most popular local activities. The area where Ponte Vedra Beach now lies first attracted the attention of Ponce de Leon more than 500 years ago. Its pristine beaches and beautiful water were not far from the spot at which de Leon famously rooted the Spanish flag. This history is documented in a 17-foot statue of de Leon that overlooks the beach access point at Guana Tolomato Matanzas National Estuarine Research Reserve. By the 1900s, people called Ponte Vedra Beach "Mineral City" thanks to its generous deposits of titanium, rutile and other valuable minerals. The area also played an important role during World War II, serving as the site of the failed German Operation Pastorius, in which several attempted German saboteurs were captured before succeeding in their mission. In the 1970s, real estate developer Paul Fletcher and his team were breaking ground on the massive Sawgrass community in Ponte Vedra Beach. When he heard that the commissioner of the PGA Golf Tour was in search of a permanent site for the famous The Players Championship, Fletcher offered to sell the commissioner 400 acres for the unbelievable price of one dollar. His attempt to gain publicity for the area was successful, and Ponte Vedra Beach has served as the host of The Players Championship since 1982. Image via Flickr by DeusXFlorida (9,099,774 views) - thanks guys! The Ponte Vedra Beach community has become synonymous with the sport of golf, with its population including several famous golfers such as Fred Funk and David Duval. The PGA and ATP tours take place in Ponte Vedra Beach, and the Golf Hall of Fame is within a few minutes' drive. Numerous golf courses are scattered throughout town, which makes Ponte Vedra Beach a popular tourist destination for golf enthusiasts. This affluent community offers plenty of surf and sand as well as a vibrant downtown with dining, shopping and arts venues. Plus, you're never far from larger towns and cities if you're in the mood for a more exciting environment. 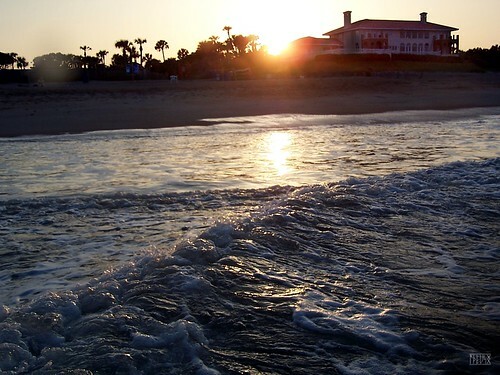 Like much of Florida, Ponte Vedra Beach boasts high real estate prices. However, this is balanced by the higher-than-average income, with more than 90 percent of the community's population holding white-collar jobs. Management, sales and financial occupations are the most popular jobs in Ponte Vedra Beach, with many businesses attracted by the highly educated population. The St. Johns County School District serves the schools in Ponte Vedra Beach. Because Ponte Vedra Beach is fairly small, private school options are somewhat limited. However, you do have a few options within city limits, as well as many campuses in nearby cities. Utilities: The energy provider in Ponte Vedra Beach and the surrounding communities is Beaches Energy. St. Johns County facilitates water and sewer services. Garbage and Recycling: The county is served by a few different waste disposal companies, so you'll need to contact them if you aren't sure which provider is designated for your neighborhood. You can expect regular collection of trash and recyclables for most single-family communities throughout Ponte Vedra Beach. Transportation: Most transportation in Ponte Vedra Beach is provided by private companies. The county does offer a limited public transit system called The Sunshine Bus Company. Ponte Vedra Beach is a fairly expensive place to buy a home, with prices that rise well above national and state averages. This is due largely to its proximity to the beach, as well as the number of golf course communities in the city. You can find a number of rental properties in Ponte Vedra Beach, including apartments, condominiums and townhomes. Our lowest priced units in Ponte Vedra Beach, FL average $59.50 per month. 114 people have reserved units in Ponte Vedra Beach, FL in the past 30 days. There are 2 locations within Ponte Vedra Beach, FL's city limits. There are 2 locations in Ponte Vedra Beach, FL that offer AC and Heating features.